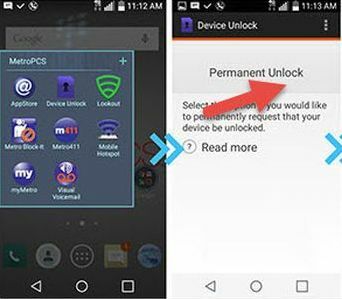 Device Unlock is an Android app that allows you to request and apply a MetroPCS mobile device unlock directly from the device. automatically apply the Mobile Device Unlock to the device without the use of a manual code. using the “Device Unlock” App. Turnaround time for delivery is less than 4 Business Days. In order to use this service, you need to provide a picture with the message that appears when you use the official device unlock app. 1. Install MetroPcs APP from Play store. 2. Open the app and press Permanent unlock. 3. 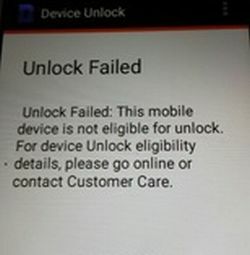 The following message should appear: Unlock Failed: This mobile device is not eligble for unlock. There is no refund if you make an order with a different message, or if your device is already unlocked. WARNING: It is very important to mention that the customer has to have data when attempting to perform the unlock, either 3G, 4G or wi-fi but data on the phone. the original software or IMEI we will not be responsible for the app not to work (Do not install custom firmware like Avatar or Cyanogen before unlock your phone). If customer cannot find the app on its phone he can easily go to applications and make it visible but a Hard Reset will always bring the app back to the phone.